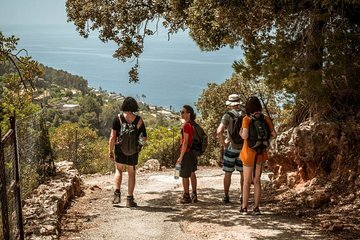 Escape the tourist crowds on Mallorca and try something more adventurous during this 8-hour hiking trip amidst the island’s rugged Mediterranean mountains. Trek through historic villages and enjoy panoramic island vistas on your way to hidden beach known only to locals. You’ll celebrate your trip with an included seaside picnic lunch of tasty Mallorcan foodstuffs. Begin your hiking trip from a departure point in central Palma in the morning. You’ll travel by local bus to the starting for the hike, walking along a historic trail once used by local postmen to travel between Mallorcan villages. The walk is fairly easy and follows a well-marked trail. Continue to put one foot in the front of the other as you admire the mountain scenery. As you walk, you’ll stop to enjoy mountain views and listen as your guide shares details about the island’s native plants. Soon you’ll arrive in the village of Serra Tramuntana, a hamlet known for its Arab-influenced architecture and rich traditions as a farming community. The hike then proceeds to a hidden beach favored by Mallorcan locals. While most tourists content themselves with the massive strips of sand found along the island’s south, this smaller shore offers a more intimate, Mallorcan feel. Cool off from the hike by enjoying the sea and the sun, and dig into a tasty beach-side picnic of typical Mallorcan delicacies. You’ll enjoy dishes like ‘cocas de trampó,’ and ‘empandas,’ finishing off the meal with typical sweets like ‘gató’ with almonds and ‘ensaimadas.’ The food comes from a historic island bakery, ensuring an authentic culinary experience. Depending on the time of year, you might finish your visit with a swim. Even during the colder winter months, this secluded stretch of coast is still perfect for soaking up a few rays of sun. In the afternoon you’ll board another local bus which will return you back to Palma. During the trip we had opportunities to see great places but we didn't get any special experience or knowledge Trip was overpriced and not very well time managed. Andreas was a great guide, friendly and good conversation on a beautiful hike on an old stone road through forests. Very tasty food bought from a local bakery and the reward of a glass of local wine overlooking the ocean at the end. Highly recommended. This was a very nice hike, with an amazing view at the end! Marialaura was a fantastic guide she also does tapas tours, and some others. She made contact with me via WhatsApp shortly after booking to make sure I had all the info I needed, and even took me out solo because I couldn't align my schedule with tours that already had people on it. It was very fun hanging out with her, and although the hike is long about 6 miles, it is not too difficult. Would definitely recommend booking this! This hiking trip was truly awsome and we had a wonderful day in the nature. Our guide, Andrea was very nice and knowledgeable. We had a small group and interesting conversations on the way. The views were beautiful, the nature amazing. The food from the local bakery was very tasty. I can really recommend it! Incredible experience. Our tour guide, Mariana, was top notch! This is a fabulous way to experience Palma de Mallorca. Definitely a tour I would like to experience again. This was a wonderful tour. We liked experiencing the history of the island by hiking between villages on the routes the postmen used to take before the roads were built. We liked buying local foods at a village bakery and then enjoying them for lunch out on the path. The figs we picked off a tree along the path were wonderful. We had beautiful views of the villages tucked into the hillsides with the Mediterranean Sea in the background. 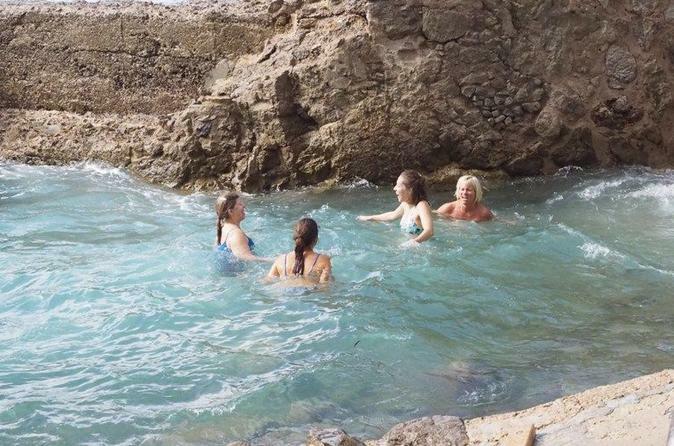 We even got to take a dip in the Mediterranean. We enjoyed having a small group so that we could get to know the other people on the tour. Our guides Marialaura and Laura told us interesting information about the history, culture, and plants of the area and got us samples from some of the trees along the way like the strawberry tree and fig tree. We would highly recommend this tour. From greeting us in the traditional Spanish style with two hugs, to making certain that we each knew our way back to our hotel/apartment, Marialaura made our day exceptional. After a short bus trip, a stop at a bakery in Esporles to buy a typical Spanish lunch, we started the Cami des Correu trail which was built in 1401 as a postal trail joining Esporles in the hills to the seaside village of Banyalbufar. The trail takes you through the scenic Tramuntana Mountains, past olive tree terraces and vineyards with stunning vistas. Marialaura's knowledge of and passion for the people, the plants, food and history of the region made this tour one of the best I have ever taken. It takes about three hours including a picnic lunch and climbs about 500 metres along a well groomed path. I would high recommend taking any tour hosted by Urban Adventures Mallorca. Wish the Viator site would allow me to post more photos. Awesome tour. Tour guide was very knowledgeable and professional. Pastries we had for lunch were delicious and sites were beautiful. I had a wonderful day with our guide Kathrin and the group on this tour. I was stunned that with urban adventures the travel groups have a small size which made the hiking way easier. Kathrin was sharing her knowledge about the route and Mallorca's eco system in a very pleasant way. It was worth it!